When editing wine program locations with menulibre the result often just breaks down with folders disappearing completely or some other weird glitch happening. I'm not sure how the folders disappearing works when you move the files around with menulibre without deleting anything from applications-merged. ...which breaks down when $directory_files expands to a list of names with spaces in them. There are ways to deal with this in shell scripts, but none of them are very pleasant (I suggest setting IFS='\n\t' and using arrays, but you have to make sure it works with bash, dash and maybe other shells). As an a propos, I have correctly installed Wine menu files in ~/.config/menus/applications-merged/ with spaces in the directory names -- but I'm not sure what installed those. I'm reassigning this bug to the appropriate product (which unfortunately is not that easy to locate). I did a fresh install recently and noticed that after installing wine and a program with it that the menus folder doesn't have a symlink gnome-applications-merged or xfce-applications.menu at all. 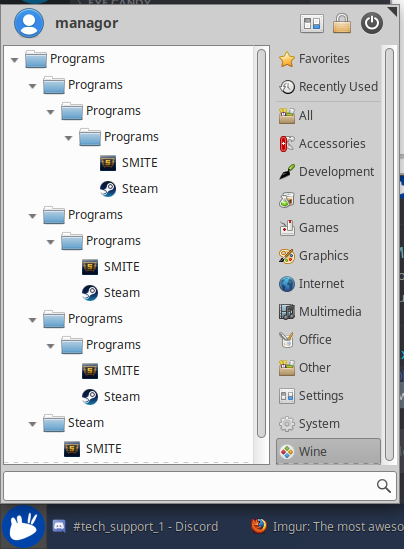 It only has applications-merged and a single .menu file for each of the .desktop files that you want to add to the menu. Possibly the reason why I was seeing duplicates in the whiskers menu. You can subscribe and participate further through the new bug through this link to our GitLab instance: https://gitlab.freedesktop.org/xdg/xdg-utils/issues/117.